New studies, reported in this article, confirm that there is a neurological pathway between imagination and patience. Lack of patience and impulsivity can get us in trouble when trying to resolve a conflict. For example, not feeling listened to can make an impatient person fly into a rage, never minding the likely negative consequence of that behavior. On the other hand, being able to imagine the desired future outcome of the situation can increase one’s patience and ability to override the impulse that makes things go south. The classic example used in divorce mediation is to ask parents to imagine how they’d like things to be at their child’s wedding. Suddenly, they’re able to see the value of squashing their momentary urge to lash back in favor of a more measured approach. 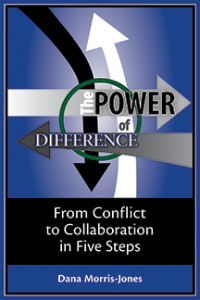 In my book The Power of Difference; From Conflict to Collaboration in Five Steps, the idea of taking the long view – i.e. imagining a future outcome that is good for everyone – is a key ingredient to creating mutually satisfying solutions to complex organizational issues. In one case, a young ambitious chef locks horns with the owner of the restaurant he works in over menus and employee policies. His initial impulse is to threaten to quit if he can’t get what he wants. By imagining a future in which he will make the restaurant wildly successful in a way that benefits everyone, he is able to work through the differences with the owner in a patient and rational way. Can you think of other situations in which imaging the future can improve one’s ability to resolve a difference?